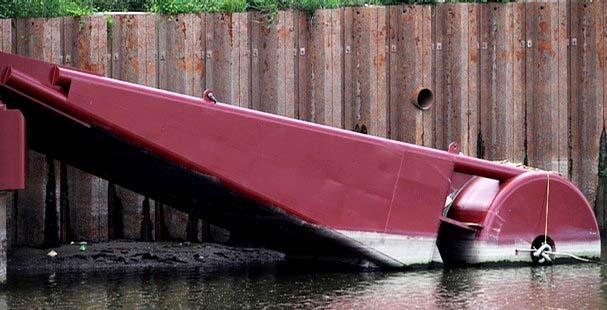 Sheet pile wall & hydraulic arm normally connects dock. Photo by Mike Brown for Commercial Appeal. Beale Street Landing has another problem. It doesn't work at low-water. Underneath where the floating dock is supposed to sit, needs to be dredged deeper. Today's Commercial Appeal reports dredging will be done next week and take a week or two. The Corps of Engineers said it's not in their scope of work. John Branston reported for the Flyer. RDC President Benny Lendermon said, "It was included in the project from the very beginning" and won't cost the City "a penny" more. Tom Charlier reported for the Commercial Appeal. Don't know, but it makes you wonder if it wouldn't have been cheaper to dredge before they attached the dock to the helical ramp. That way maybe they could've avoided the expense of unhitching the dock and moving it over to the Cobblestone Landing. In hindsight, it also might have been a good idea to pay more attention to that part of the RDC Riverfront Master Plan where it talks about the constant slope of the Cobblestone Landing and calls it "the perfect form for boat landings given the river's rising and falling tendency."